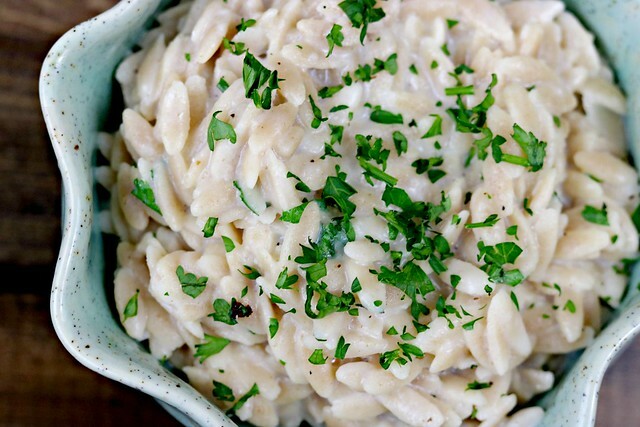 Creamy, cheesy, garlicky orzo makes the perfect side dish for…pretty much anything! I’ve realized recently (not for the first time, either) that I don’t post nearly enough side dishes on here. And, truth be told, I don’t make that many worth posting. I have my basics that I mostly stick to and they require very little effort. 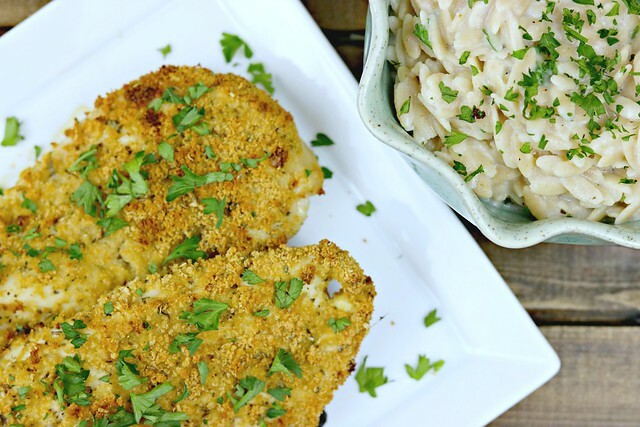 You know…I pick a veggie, I pick a starch. I steam or roast or saute, and call it a day! I like to focus on the main dish, mostly. 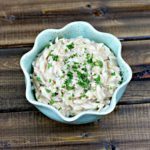 However, this particular starchy side dish, is one of our favorites. And, while it is pretty darn easy to make, it does require a little more effort that tossing in olive oil, sprinkling with salt and pepper, and throwing it in the oven. Not much more, but more enough to validate me posting it here for you all! Things have been very busy around our house the last week or two, so I’ve been getting dinner done later and later, it seems. Who doesn’t like to eat at 8 pm or later, right?? And when I’m running behind, the last thing I can handle is labor or time intensive food. And this, my friends – this little pasta dish – is just exactly what works for me. 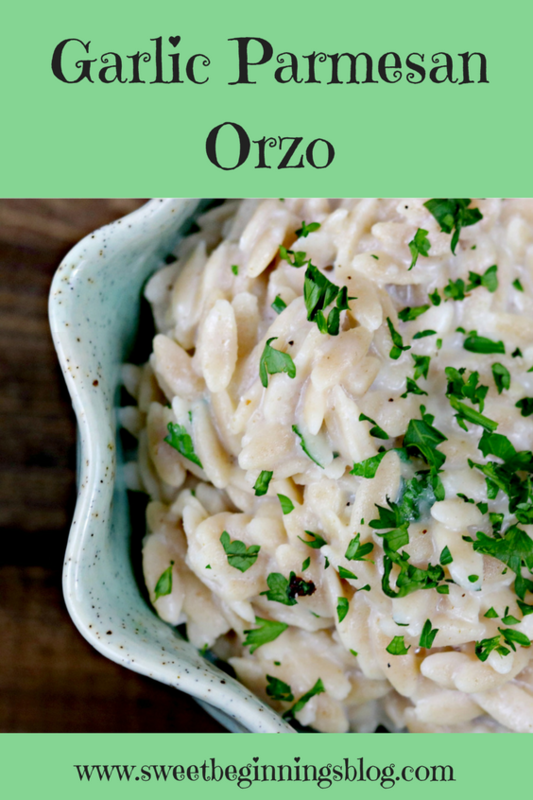 Cook the orzo, drain the water, melt some butter with garlic, add milk, cheese, salt & pepper, mix the orzo in, add parsley. Eat. 10 minutes, tops. So easy, it almost doesn’t need a recipe, right? Almost. It took me a few tries to really get the ratios right, but now that I have…it’s game on, every time. And J loves it. He’s not typically a pasta fan (he does not share my love for the Near East pearled couscous that I so adore), but this one he is on board with. And how could he not be? 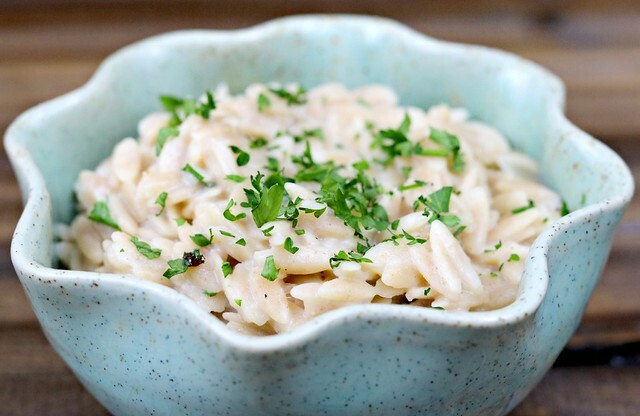 I mean, creamy, cheesy, garlicky pasta – who wouldn’t love it?? Who, I say??? And before too long (maybe next time I make it), Natalie will be able to eat some, too! Did I mention that she just turned 6 months old on Sunday?? Hold me. My little baby is growing up so fast! And she loves to eat. She only eats little bites of different things we eat, for now, but she’d eat a whole plate if we let her, I’m quite sure. Guess she’s bound to be a little foodie, like her mama. First it’ll be orzo, and before we know it, she’ll be taking over my kitchen and cooking gourmet meals. Ok, maybe not (unless she wants to, of course) but at least she’ll probably like to help mama in the kitchen when she gets a little older. 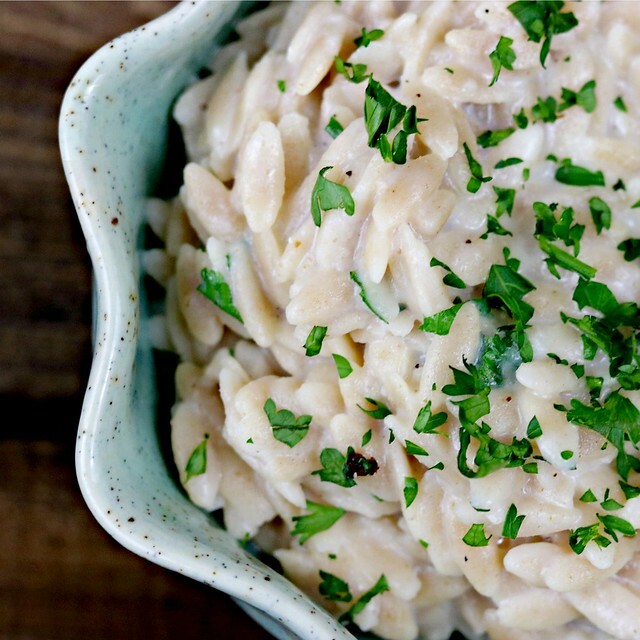 Creamy, cheesy, garlicky orzo makes the perfect side dish for...pretty much anything! Heat water or broth in a medium pot, to boiling. Return pot to burner, over medium heat, and add butter and garlic. Stir until butter is melted, then add the milk and Parmesan. Stir until cheese is melted, then season with salt and pepper. Add orzo back to pot and stir to combine. Taste and adjust seasonings, if needed. Remove from heat, stir in parsley, and serve!